Certikin is a main sponsor for the seventh edition of the Piscine Forum Pool & Spa Expo and International Congress and will also be exhibiting at the flourishing event this week in Bologna. Ahead of opening the doors to wet leisure and hot tub professionals from Italy and throughout Europe, organisers have already declared that visitor numbers for the three day event, running from February 19 to 21, will surpass last year’s total, which enjoyed a 20 per cent increase compared to the fifth edition in 2013. In conjunction with the International Congress that will attract a wide audience of professionals from the pool, wellness and fitness sector, the event will also have an area dedicated to projects by young engineers and architects of spas who attend the prestigious Poli Design master program in Milan. The growth and development of the exhibition has been boosted by the support of trade associations including the Italian association of pool manufacturers Assopiscine; along with the synergy with ForumClub, the only Italian B2B show dedicated to training and updates in the fitness and wellness sector. Exhibitors at the Piscine Forum Pool & Spa Expo will include: Abrisud, AquaTech Group, Barchemicals Group, Biodesign Pools, Certikin, Etatron, Fluidra Commerciale Italia, GES Group, Hayward Pool Europe, HotSpring Italia, IBIX, Invitalis Italy, Luxe Pools, Pentair Aquatic Systems, SCP Italy, Teuco, Tintometer, Wellis, and Zetapool. As well as being a sponsor of the event, Certikin representatives will be aiming to expand the Italian and European network by promoting the fact that retailers can tap into thousands of wet leisure product lines. 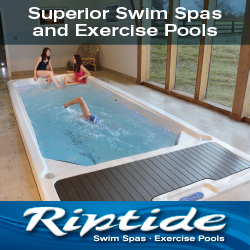 These include a non-invasive ePIPE system, which was promoted to the British trade and international visitors at SPATEX, that can provide spa and pool specialists with the capability to effectively detect and rectify leaks. Other products include a SpaPilot for portable spas to increase the options in the Autopilot salt chlorinator range. It can be installed in new hot tubs or retro fitted to produce 9g of chlorine per hour, and includes a digital display and built in diagnostics and error reporting. Certikin, which distributes the Caldera Spas and Fantasy Spas hot tub brands by Watkins Manufacturing, has also boosted its offerings this year with a new range of UV Systems; and two new Vaporex 34 and 56 air-to-air heat recovery dehumidifier models. HotSpring Italia will also be highlighting another world-leading brand from Watkins Manufacturing; which has been promoting the retailing success of its cutting-edge Highlife Collection NXT range, following record sales for three innovative designed models that have had production input from BMW Group Designworks USA. The trio of NXT designs include the three-seater Jetsetter NXT, which comes in at 213 x 165 x 84cm and has 22 jets; the five-seater Envoy NXT, which comes in at 236 x 231 x 97cm with 43 jets; as well as the seven-seater Grandee NXT, which comes in at 254 x 231 x 97cm and has 43 jets. All three models have the ACE Salt Water Sanitisising System as standard, while there is also an option to combine the models with the EverFresh System. Wellis will also be among the exhibitors to promote its European manufacturing status and will be showcasing the Italian debut of the new Dabassy and WELLONE models, which are making their Italian debuts after exhibition appearances in France and England. The Dabassy, which comes in at 236 x 236 x 86.6cm with three 3HP massage pumps and seating capacity for five people including two lounge seats, has already been showcased to the British trade during the UK Pool & Spa Expo at the Birmingham NEC. Visitors to the Wellis stand during the three-day Bologna-hosted event have the chance to see why the Dabassy has been dubbed ‘the future of hydrotherapy’ by the Hungary-based manufacturer. Representatives for the hot tub brand will also be promoting three single occupancy WELLONE options that provide an indulgent oasis of therapeutic heat, buoyancy and massage within the Premium, Deluxe and Indoor models. Teuco, which was the first brand to introduce a Turkish bath in a shower enclosure during the 1980’s, will be looking to capitalise on home advantage during the event. While cementing and expanding its Italian customer base on home soil the company will also be promoting a wide range of products. These include examples from the Hydrospas range such as the Seaside 640 Mini-pool, and Seaside T08 Hydroline, Arja Finnish sauna, and the Pasha Steam Room.